The low profile and plush back cushions of the Oasis outdoor sofa are perfect for lounging, while subtle flange seams add a look of casual sophistication. You’ll appreciate its supportive feel and the option to arrange the pillows for your comfort. The marine-grade plywood frame, antimicrobial foam and worry-free Sunbrella® fabric brings you the best in outdoor performance. Zippered back pillow covers are easily removed for machine washing (or simply rinse off everything with your garden hose). Oasis has a flexible design that allows you to combine sofas, chairs and chaises to create sectionals for outdoor entertaining and lounging. Whether you use pieces together or on their own, Oasis is made for modern outdoor comfort. We build our outdoor upholstery frames to the same high quality as our indoor frames with the addition of weather-resistant enhancements. We build our outdoor frames with kiln-dried, marine-grade plywood. Used in boats and docks, this engineered material consists of layers of water-resistant hardwood bonded together with a waterproof adhesive. Kiln-drying removes moisture, minimizing expansion and contraction from the elements. An all-weather material, marine-grade plywood features cross-directional grains to resist warping and cracking for lasting durability. 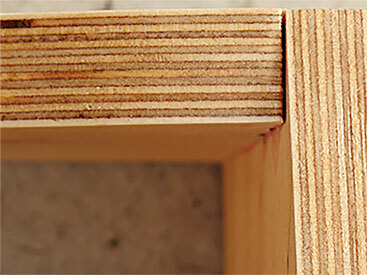 We reinforce every joint in our outdoor frames for added stability. Precision-cut parts interlock like puzzle pieces and are supported with eco-friendly, waterproof glues, rust-resistant screws or staples and corner blocks. 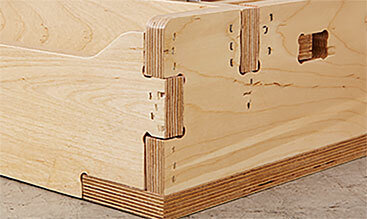 Reinforced joinery ensures your seating holds together, even with years of frequent use and exposure to the elements. A webbing suspension is made by interweaving strips of weather-resistant nylon material to create a resilient platform. 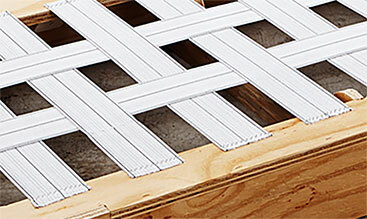 The elasticized webbing is securely attached to the marine-grade plywood frame with rust-resistant staples. Webbing suspensions are ideal for thin-profile styles that require maximum support in minimal space.